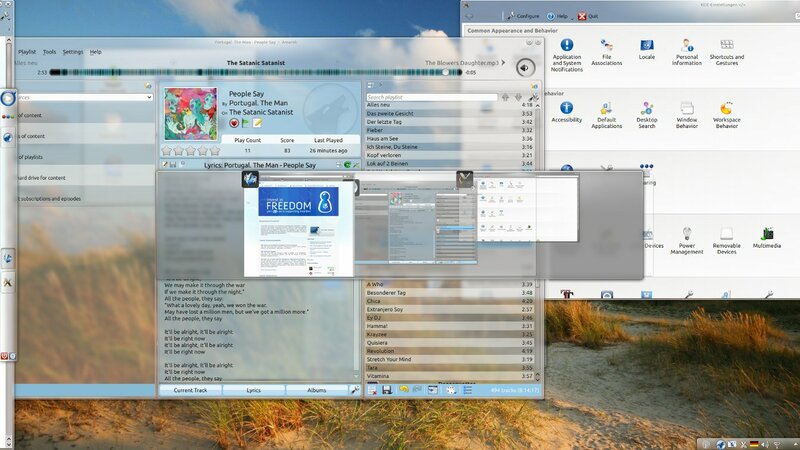 Anton Kreuzkamp, a 15 year old KDE developer has come up with a fantastic new way of managing space on virtual desktops. This experimental method, called 'The Workspace Strap' can combine free space of multiple desktops to manage windows more efficiently. Using a Kwin effect, the workspace strap method allows us to organize windows on a linear strap, either horizontally or vertically, that supports stepless scrolling. When Alt+Meta (configurable) is pressed, we get a preview of the strap and can easily scroll by dragging. This method is still experimental and after it is polished enough, it can be integrated upstream. A working code can found here or on git repository.